It features Aluminum alloy frame, tempered glass face, fashionable design and stable display performance. A perfect match for hotels and can also be used at bank, store, airport, hotel, station, summit, theatre and other indoor areas. It's very easy to operate - just plug it into any device and play. Supports a wide range of devices. The integrated design has everything in-built like Apple box, loudspeaker, control card and power supply. Plug and play is very convenient to use. The Indoor Advertising LED TV Display features perfect proportion of width and height which does not only enhance its beauty, but also gives you a comfortable viewing experience. The ideal size provides best display effects and makes it suitable for every place. The display can be used at different places and can serve different purposes. Starting from a private club reception to hotel lobby and bar, it can be installed anywhere. It can be used for advertising purpose and for entertainment purpose, for information broadcasting and training. Basically it serves as a simple display, but becomes a powerful info-tainment tool when connected with other devices. When connected to Apple STB, it supports dozens of languages. Its multilingual feature makes it usable across the world. It can be used to send pictures over iOS system device to LED TV by Wi-Fi. Send real time pictures during your presentation. Simple data transmission makes it more usable and convenient for demonstrations, teaching and training. 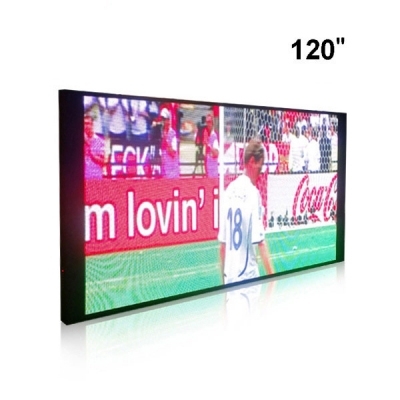 The Indoor Advertising LED TV Display is a great tool for information broadcasting, and can be used as an advertising media and training module. But when connected with Apple STB, it shows your favorite TV shows. So you get more information and more entertainment over single display.